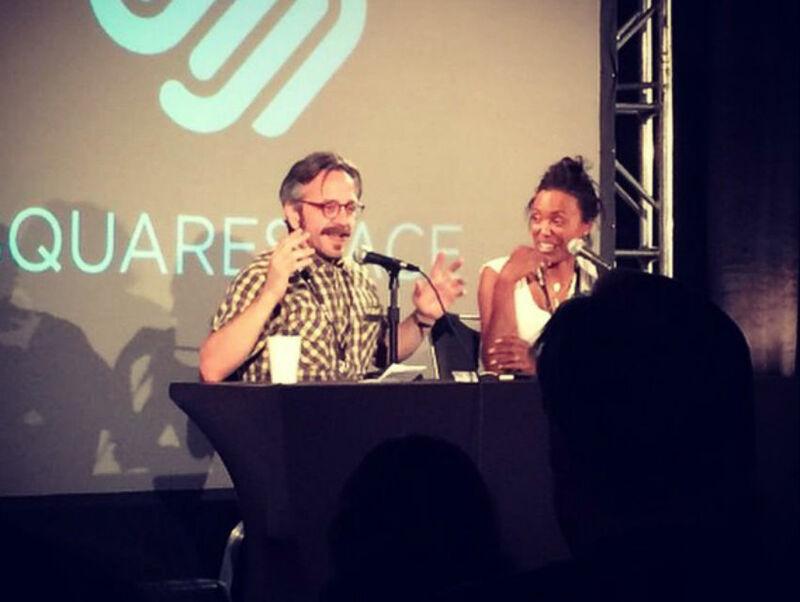 Marc Maron and Aisha Tyler at last year's Podcast Festival. September 18, Beverly Ballroom, 7p.m. – 9 p.m.
Comedian and weed-enthusiast Doug Benson (Super High Me, Getting Doug With High) kicks off the Fest with his celluloid podcast. Expect lively comedian guests playing film-related games. September 19, Hollywood & Sunset, 12 p.m. – 2 p.m. Hilarious husband-and-wife duo Kumail Nanjiani and Emily V. Gordon discuss all things video game-related (and more). When not podcasting, they can be found at Meltdown Comics running the show The Meltdown with Jonah and Kumail. September 19, Beverly Ballroom, 7p.m. – 9 p.m.
No list of podcasts is complete without comedian Marc Maron’s legendary show, usually hosted from the garage of his house in Highland Park. Past guests have included Sarah Silverman, Margaret Cho, Adam Carolla, and President Barack Obama. September 19, Beverly III, 9p.m. – 11 p.m.
Comedian Paul Gilmarten talks openly with guests about a range of mental health issues like anxiety and depression. The weekly show, which has received numerous accolades, is one of the top-rated self-help podcasts on iTunes. September 20, Beverly III, 2p.m. – 4 p.m. Host Aisha Tyler (The Talk, Archer, Talk Soup) conducts fun and thoughtful interviews with a range of actors, comedians, writers and musicians.